God's Love: He Even Knows Your Phone Number! As Valentine’s Day approaches, the time when the world focuses on romantic love I’d like to share with you about God’s Love which is a higher type of love because it never fails. Remember, you are eternally loved by the King of Kings Himself. He knows your name, your situation, your needs and He even knows your telephone number. God even knows your phone number! I once dreamt about a phone number. It kept coming up in my mind. I woke up at 3 am and couldn’t shake it. I had to write it down. When I woke up in the morning the number once again filled my mind. “Is this You Lord?” I asked. He told me to call the number and let them know how much He loved the person who answered and how He had a plan for their life. I nervously made the call and a young man answered. I gave him the message and he began to weep. He told me he had just given His life to God but as nothing had changed, he’d decided to return to his old ways. “Sir, do you realize that God Himself has your phone number?” I responded. “He gave me your number in a dream and told me to let you know how much He loves you! Isn’t that amazing?” There’s more to this story, but you see what God is saying. He loves each of us so much and I want to remind you of His love and tell you that there is nothing that can separate you from His love. Among those who celebrate Valentine’s Day, perhaps some are wondering what has happened to their love. Shattered relationships, broken covenants, love that has turned to indifference and dreams that have come crashing down, all give LOVE A BAD NAME. This is so sad because TRUE LOVE is not like that. Many are confused by love and avoid it because of all the hurt, disappointment and sorrow. But this should never be. Have you checked your love meter recently? How does it stack up against God’s Word? This is the LOVE that we at GOD TV are committed to spreading worldwide. The love that never fails and the greatest love of all, Jesus Christ. There is no greater love than laying one’s life down for another. This is the love Jesus has for us. He gave His life so we may live. We want to follow our Lord’s example as He went around doing good, feeding the hungry, healing the sick and setting the captives free. We aim to show compassion towards all people as we demonstrate God’s love to the world this Valentine’s Day and always. I pray that the Lord overwhelms you with His love. May His presence FILL YOUR HOME and draw you closer to Him. 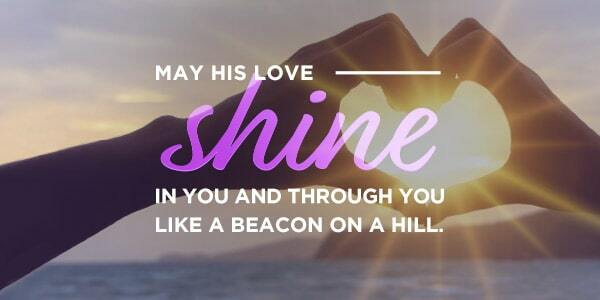 May His love SHINE IN YOU AND THROUGH YOU like a beacon on a hill. I pray this will be a season where you sense God’s love in a tangible way, a time of victory for you and your family. Jesus Christ is the greatest love of all. May you experience the TRUE LOVE that Jesus has for YOU. This love can never be taken away.